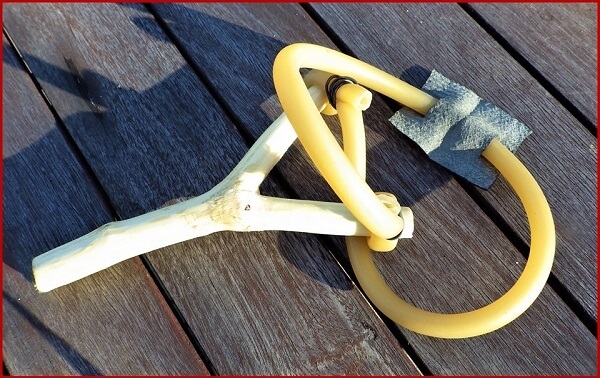 Unlike many primitive weapons that have been around for millennia, slingshots have only shown up in the last century and a half. 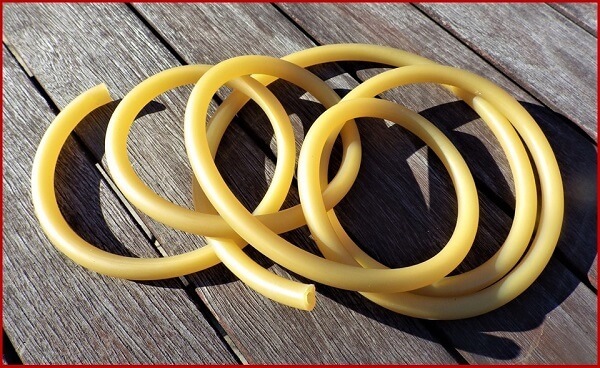 It was the invention of vulcanized rubber in 1839 that finally provided the critical source material to make a slingshot effective: rubber inner tubes. After World War II, the popularity of slingshots took off as commercially manufactured slingshots hit the market. It was some of the innovative ideas that came with these products that migrated slingshots from recreational toys for pinging tin cans to serious and legitimate hunting weapons. Perhaps the most significant innovation in commercially manufactured slingshots was the Wrist Rocket introduced in 1954. 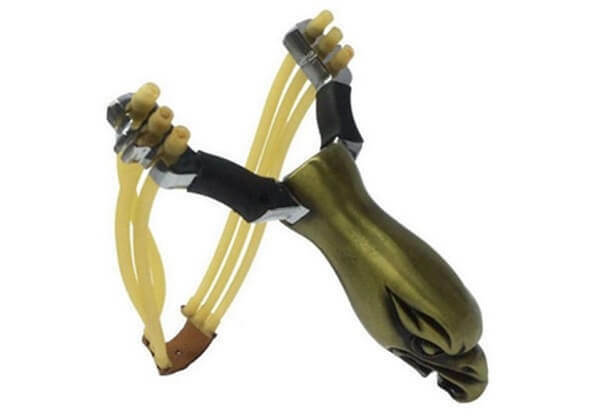 This Wrist Rocket slingshot had a brace extending from the bottom of the handle that curved over the wrist, allowing for an easier draw on the elastic bands and higher velocity. This also relieved some of the strain on the hands and wrist and provided a steadier aim and delivery. The name of this company was actually the “Wrist Rocket Company,” but they later changed their name to TruMark. A second innovation to emerge was the use of surgical tubing as an elastic propellent rather than a strip of cut inner tube. The surgical tubing provided the best draw on a slingshot and its uniform shape made for greater accuracy and inertia. You can find surgical tubing at some hardware stores and home centers, or at some pharmacies. You can also track it down on the Internet with a Google search for surgical tubing. 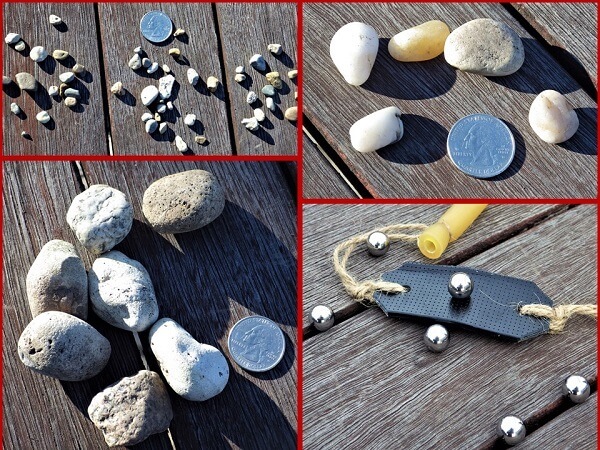 Small ball bearings also emerged as the ammunition of choice, replacing the pebbles that filled the pockets of young kids in the early days of slingshots. 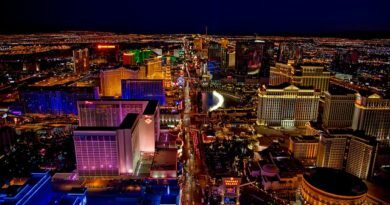 Whether a slingshot is made in a little boy’s backyard or engineered and manufactured commercially by the big boys, they all share some of the same basic characteristics in terms of their design. In nature, this is defined as a forked branch providing a handle and two uprights in a Y shape to hold an elastic band attached to a pouch. 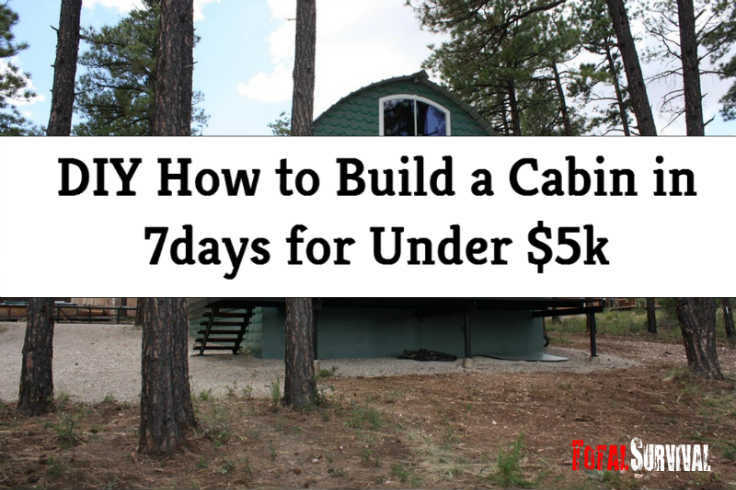 The construction is basic, but you’ll need some tools and materials. A tree saw with a long, extendable handle to cut branches from high in trees. A sharp knife for peeling bark from forked branches. Pliers for twisting wire if used. Kitchen shears for cutting surgical tubing, rubber inner tubes, strings or floss; leather or canvas for pouches. Two uprights forming a gap that both hold the elastic bands and allow a channel for a projectile to travel through. Elastic material that will both stretch and deliver significant force when released to propel a projectile. These could include Bungee cords, surgical tubing, rubber strips cut from an inner tube and rubber bands. 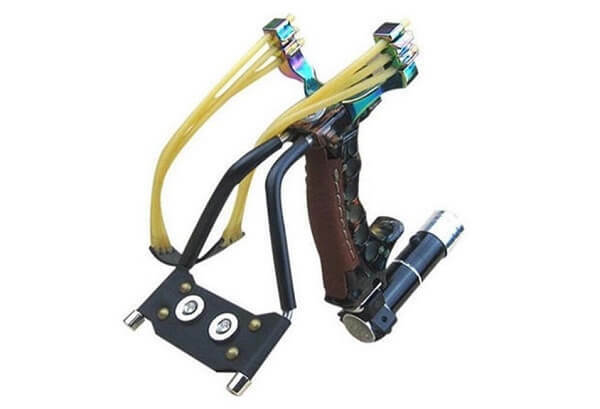 How the elastic material is attached to the slingshot is important and there are numerous ways to do it. We’ll cover a few as we go. A pouch to hold the projectile. Sometimes a small hole is cut into the center of the pouch to better hold the projectile. The pouch can be made from a piece of inner tube, canvas, or leather. This could be small pebbles or ball bearings. The smoother and rounder the pebble, the better. Ball bearings are the slingshot ammunition of choice because they are of consistent size and weight and are aerodynamic, resulting in greater accuracy. Their weight relative to their size also delivers greater speed and inertia to every shot. Marbles also work. 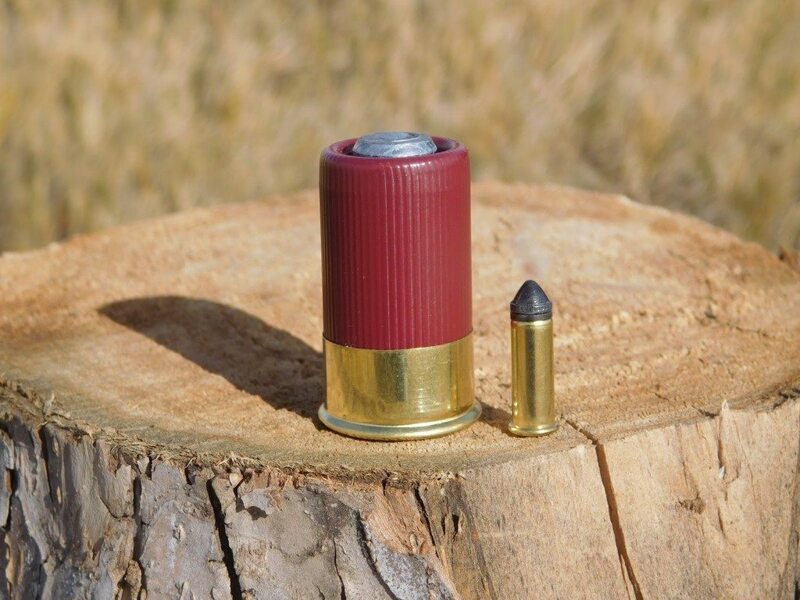 The disadvantage is that you’re unlikely to recover any ball bearings you shoot in a hunting situation. That’s the advantage of pebbles. They’re free. Something else you might notice in the photo above is the collection of gravel. Think of it as slingshot buckshot. A thimbleful of gravel in a slingshot pouch can work to bring down small birds at a distance in a survival situation. It may seem unfair to the birds, but if you’re starving in the wild, everything is fair game. 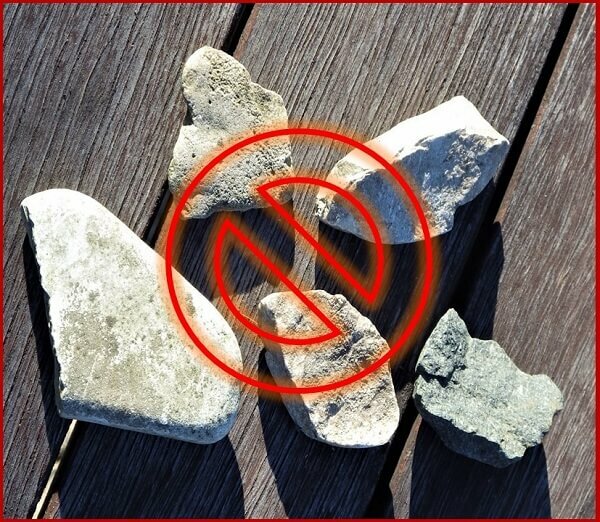 While you’re hunting and gathering your rocks, you’ll want to avoid rocks that are flat or have irregular, angular surfaces. These shapes affect the aerodynamics of the stone and they will fly off into directions far from your intended target. 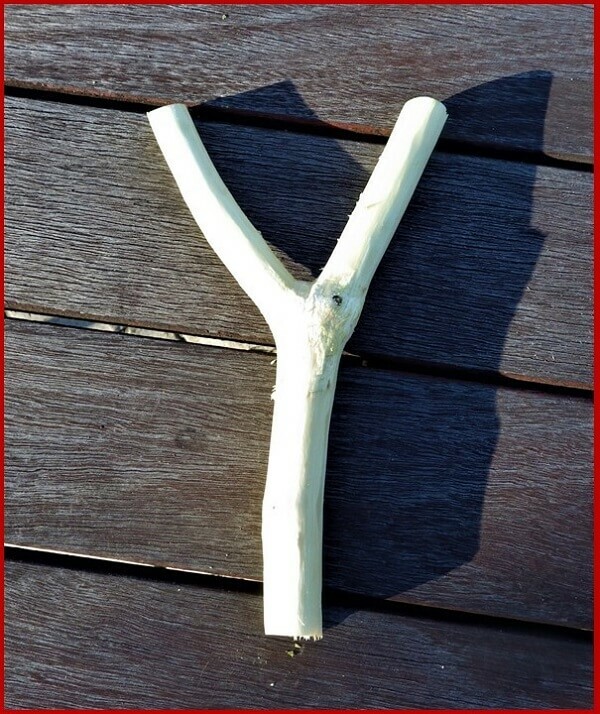 The obvious starting point for making your own slingshot is to find a branch of a tree that creates a fork. How many of us have noticed that perfect shape while cleaning up branches and brush? If you’ve ever had that experience, you’ll probably be quick to find the slingshot possibilities in this tree. Maples seem to emerge as a popular choice for slingshots. The wood is hard, and Maples seem to produce a variety of forked branches in a perfect Y shape. Green trees are best because the wood is stronger than dead wood. 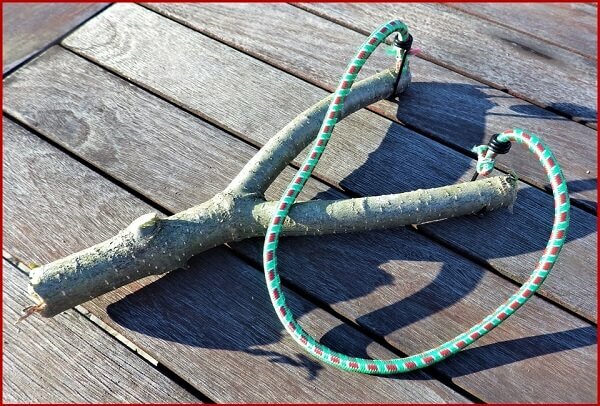 Once you’ve identified your branches it’s a simple matter to saw branches into a slingshot shape. Trees to avoid include softwoods like pines, springy woods like willows, and weaker woods like boxelder. The problem with all of these tree types is that they tend to bend or yield when the slingshot is drawn. It may seem like a good idea to add a little spring to any shot, but it actually compromises speed and accuracy. This is one of the reasons why even hardwoods used for a slingshot sometimes need to be dried or seasoned after being cut. You can leave the bark on the slingshot or shave it off if you want a smoother grip. After peeling the outer bark, you should also hold your knife vertical to the branch and scrape off the green, inner cambrium layer of slippery bark still adhering to the branch. It’s the same motion you would use to peel a carrot. There’s a lot of advice about drying or seasoning the green wood for a slingshot. One recommendation is to slowly roast it high over a fire. Another is to wrap it in a dish towel and microwave it for 30 seconds and then wait a minute and repeat until it’s dry. 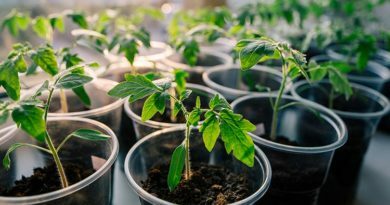 In actual fact, many trees are not springy and provide a stiff, strong slingshot frame right off the tree, so seasoning is up to you. Over time the slingshot will also season itself. 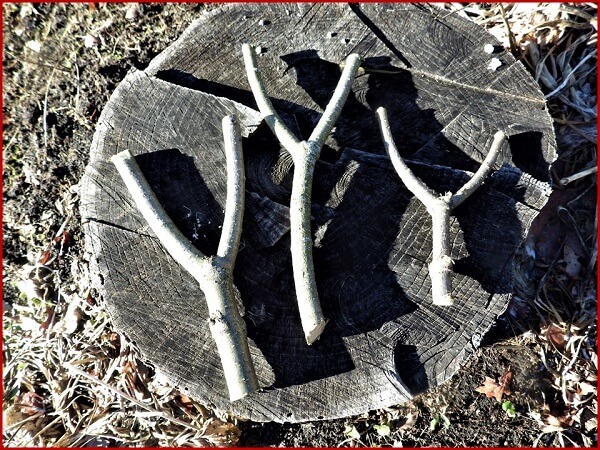 We’re going to look at 4 ways to make a slingshot using a Y branch from a tree. The difference is the elastic material used to fire the slingshot. 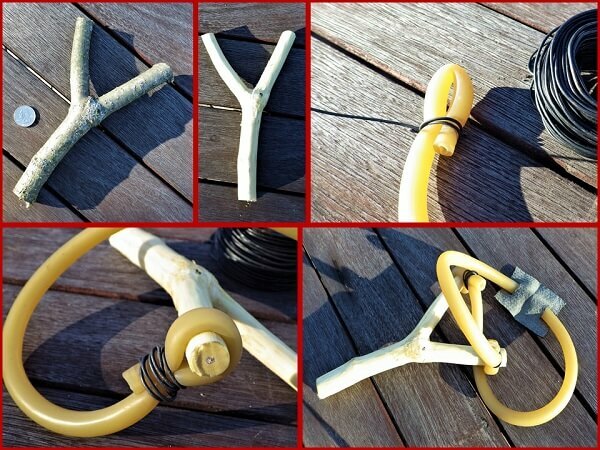 This slingshot is very easy to make and is ideal for kids to both assemble and shoot. It has a wide gap and fairly thin branches that will make it easier for a kid to hold, draw, and safely fire. While the rubber bands don’t deliver the firepower of surgical tubing, they propel a stone surprisingly far when bundled together. The rubber bands are also easy to replace. 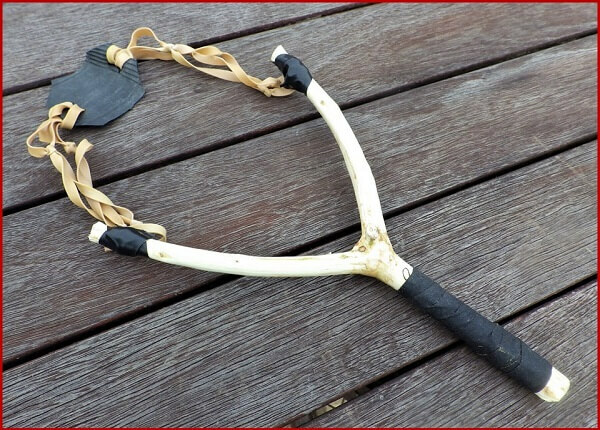 It uses a peeled Y branch with some friction tape wound around the handle for a better grip. The rubber bands are connected together using 3 rubber bands looped over the ends of each other to create a long band. This is then interwoven with another set of 3 looped bands. The pouch can be made out of a piece of inner tube or leather. Two holes are punched into the pouch on either end and the rubber band ends are pushed through and then looped to connect the bands to the pouch. The end of the bands are then twisted over the top of one of the tips. They’re held in place with a few wraps of electrical tape and you’re ready to test fire it. This style of the slingshot is where it all began. 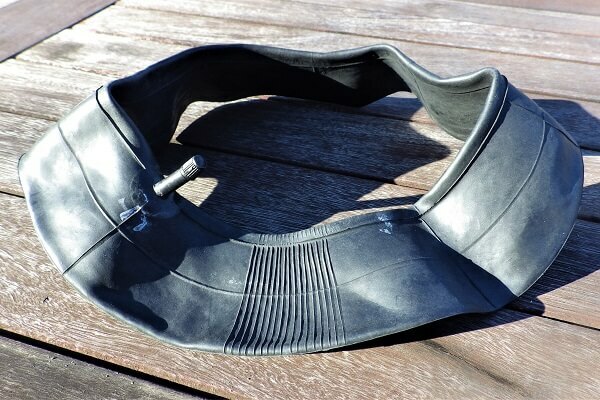 It used to be easy to find an old inner tube in the garage, but good luck with that. If you ask around at bike repair shops, they may give you a damaged tube from one of their junk boxes or you may have to buy a new one. They run from 5 to 10 bucks. Remember to save some of the rubber tubes to make pouches if that’s the kind of pouch you prefer rather than leather or canvas. Select a Y branch and peel the bark. Season it if it needs it. Cut a strip of rubber from the inner tube about a 1/2-inch wide and about 16 to 20 inches long. Cut a pouch from the inner tube and cut two slits 1/2-long on each side. Slide the rubber inner tube strip through the cuts in the pouch. Curl the inner tube strips around the forks of the slingshot and fasten with electrical tape. Surgical tubing is the elastic propellant of choice these days. 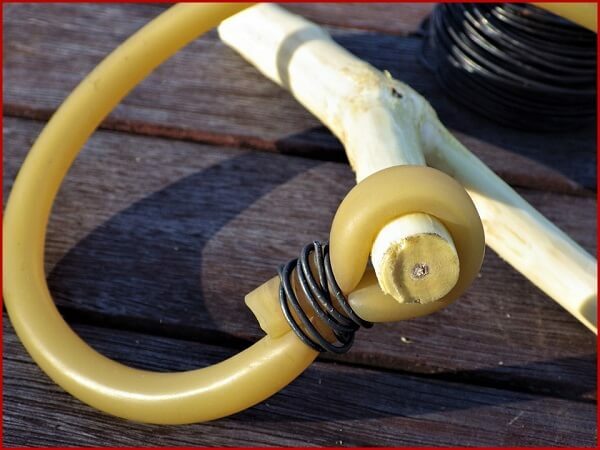 This is the most powerful homemade slingshot due to the excellent propelling properties of the tubing. Select your Y branch and peel the bark. Season and dry the bark if you think it needs it. Cut a pouch from leather, canvas, or a piece of inner tube and cut two small slits on both sides. Insert the tubing through the slits to attach the pouch. Using bailing wire or dental floss, create a loop on both ends of the surgical tubing and bind the ends to securely hold the loop. 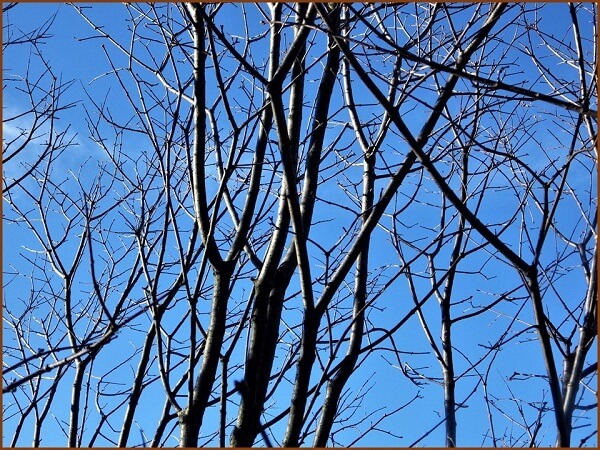 Pull the loop of tubing over each end of the forked branches. This seemed like a good idea at the time, but it was a disappointment. Assembly couldn’t have been easier. A forked branch was cut and the curved hooks on the ends of the Bungee cords were attached to the ends of the fork. A pouch was later added, and it was test fired. There was only one problem. It didn’t work. The elasticity of the Bungee cord was limited, and it could hardly hurl a stone 20 to 30 feet with minimal velocity. Too bad because it was very easy to make. 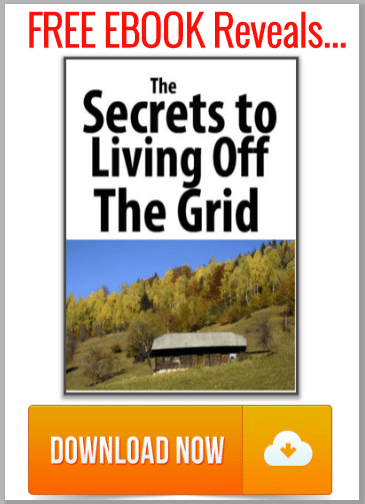 If this idea crosses your mind, don’t bother. 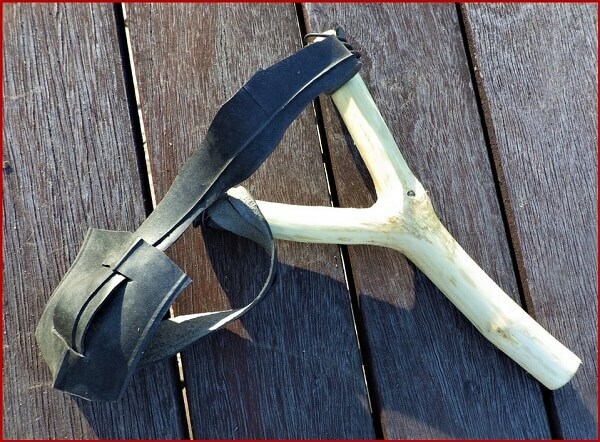 Slingshots that need to be restored usually need new elastic bands and a pouch. The handle and the forks are usually the most resilient, but any rubberized material is subject to cracking, rotting, and tearing. Clean and thoroughly dry the metal fork. Measure the tubing by drawing it back so it reaches to your cheek with your arm extended in front of you and cut two pieces to equal size. Slip the tube over the metal uprights working the tube down the shaft. Cut a length of twine to attach the pouch to the tubing. Cut a pouch from leather, rubber or canvas. Tie the twine around the tubing leaving two ends of twine. Make sure there’s nothing in the background that can be harmed by a high-velocity projectile. This includes people, pets, cars, buildings, or anything else that can be dinged or shattered. Practice in a clear, open area. Trees in close proximity could cause a stone or ball bearing to ricochet. If you want to collect your ammo after practice, angle a sheet of plywood at 45 degrees behind your targets. 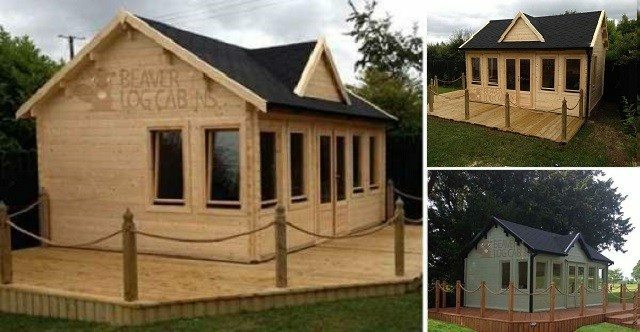 A tarp or sheet on the ground under the plywood is also a good idea so you can easily find and collect your pebbles and especially any ball bearings. Tin cans are the target of choice for most sling shooters, but if you’re firing a slingshot for the first time or practicing with kids, empty 2-liter plastic bottles are fun to use. 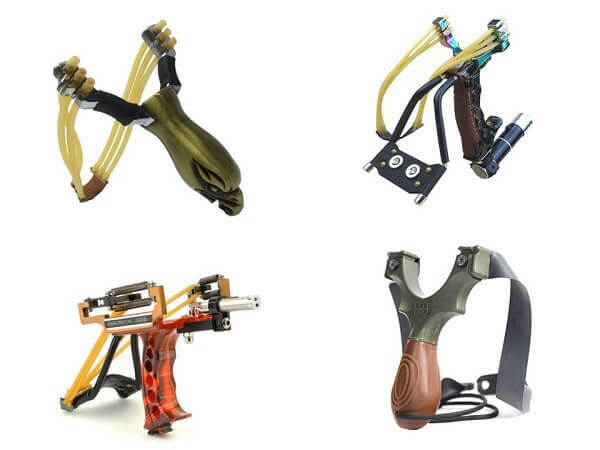 If you have different types of slingshots, try to understand the unique dynamics of each one. 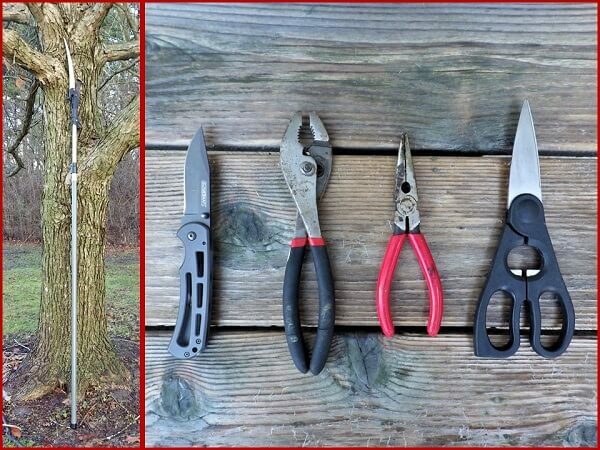 A homemade slingshot from a fork in a tree is going to perform very differently than a Wrist Rocket. 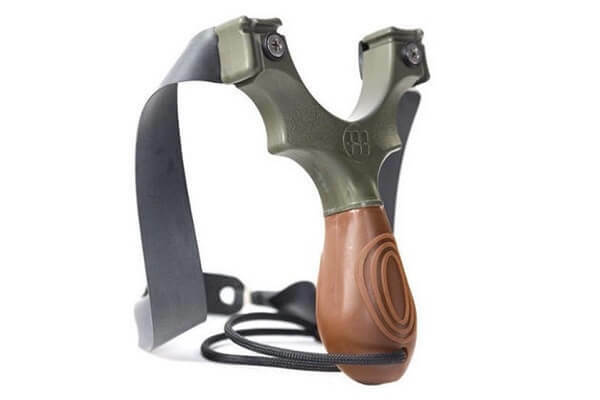 If you want to do some serious target practice, hunting, or enter a slingshot competition, you’ll want to think about some of the commercially made slingshots. They all feature some unique innovations including the Wrist Rocket design and the addition of multiple bands of surgical tubing to increase velocity. They also feature ergonomically designed handles to provide greater stability and less strain on the hand and wrist after repeated firing. Because they’re designed for comfort and a firm grip, they’re a favorite of hunters, especially since multiple surgical bands can deliver a ball bearing pellet with a velocity close to a bullet. And get this–some of these models have lasers attached to the handles! 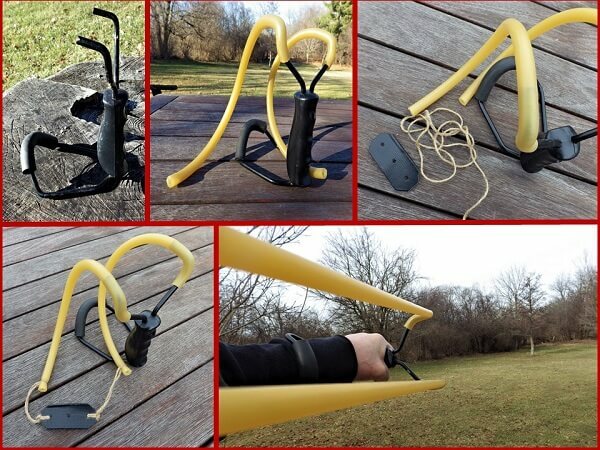 These are serious slingshots and are in fact deadly. That’s why the standard advice for these slingshots is to handle and respect them the same way you would with a firearm. In fact, the state of New York has banned the use of slingshots with a Wrist Rocket attachment. 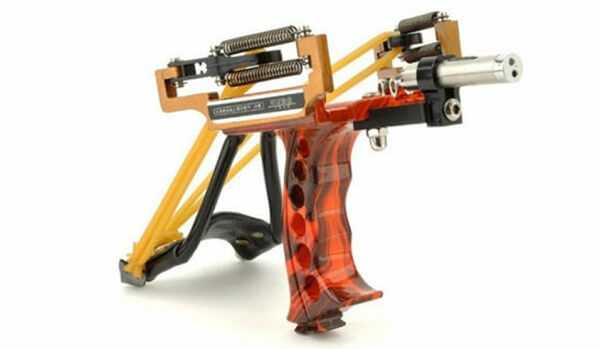 Slingshots in this category range in price from $30 to $150 depending on the features and construction. Try as we might, we don’t always hit the target. The usual solution is to reload and take another shot. But slingshots can present some unique dangers. Hit a tree with a bullet and the tree trunk splinters with a bullet buried inside. Hit a tree with an arrow and you spend a few minutes cutting the arrow point out of the trunk. Hit a tree with rock or ball bearing from a slingshot and it might come back at you like a golf ball. This could also be a problem if you are shooting marbles as ammunition and the marble shatters into a ricochet. If you haven’t drawn your band back squarely or if the elastic bands are incorrectly sized, the rock or ball bearing could hit the hand that’s holding the handle of the slingshot. It will hurt and could break a bone or two in your hand. The bone located at the base of your thumb is usually the most likely area to get hit because it’s sticking up towards the slingshot gap as you hold the slingshot. The stone or bearing could also hit the slingshot and ricochet back at your face. Elastic bands on slingshots deteriorate with time. As a result, a band can suddenly break free from the slingshot and snap back into your face or worse – your eye. Bands that are improperly attached can also break free when drawn back and snap back towards your face. A variation on this type of action is when one of the supports in the Y shape snaps off at the base and comes back at your face with a piece of wood still attached to the band. This is more likely to happen with a homemade slingshot fashioned from a tree branch. Wear protective eyewear whenever you fire a slingshot. Make sure everyone in a group, especially kids, do the same whenever a slingshot is being fired. Test a new slingshot first with a lighter projectile like a paint gun pellet, acorn, or another less dense projectile to make sure everything is aligned properly. This is especially important with a homemade slingshot. 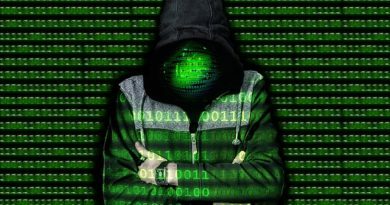 Double check to make sure there is nothing in your line of fire that can be damaged or hurt including people, pets, or anything of value that you don’t want to be shattered, dinged, or dented. Check and replace worn bands on a regular basis. Don’t leave a high-velocity slingshot laying around where children can find them. 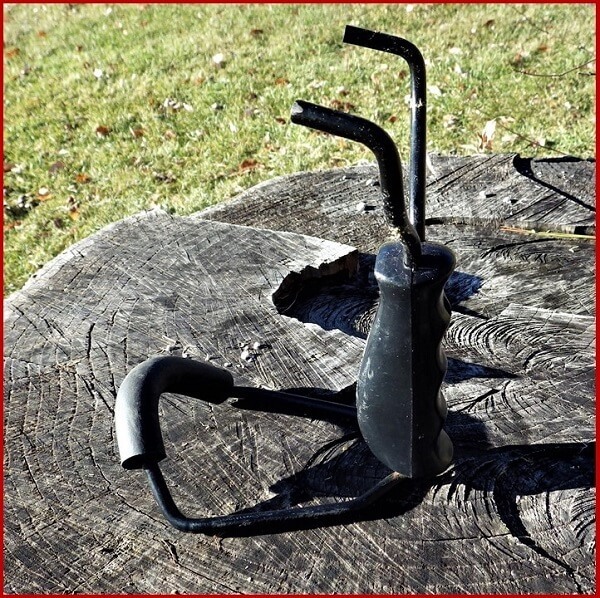 Treat your hunting slingshots like a handgun. Both can be lethal. Make sure you have a backstop when target practicing to both recover your ammunition and to avoid sending a shot far beyond your property or intended target. 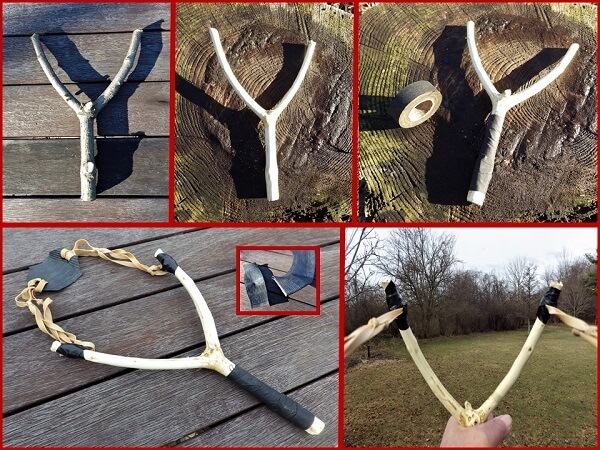 Once you’ve assembled some of the basic materials to construct a slingshot, it’ll be easier to improvise another one if the opportunity presents itself. This usually happens when you come across a fallen branch in the yard presenting a perfect Y shape, or when a young son or grandson finds your old slingshot in the garage. 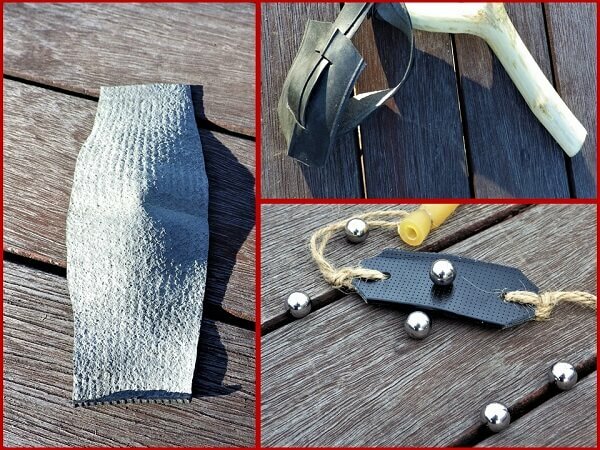 Making a slingshot with one of your kids can be a very rewarding experience and once you have those tin cans set up… a whole lot of fun.